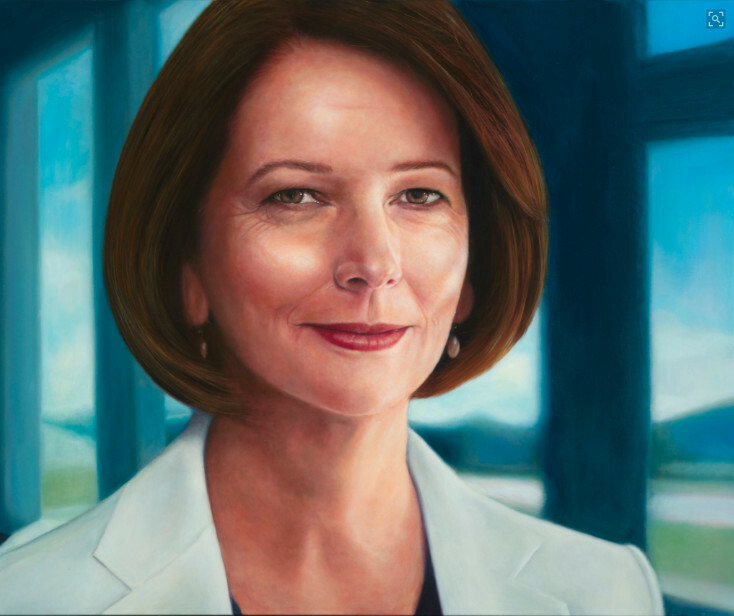 In the week after the Wentworth by-election that had been called because the prime minister, Malcolm Turnbull, had resigned from his seat, Julia Gillard’s official portrait was unveiled at Parliament House in Canberra. The timing was somewhat ironic as Gillard had started the run of prime-ministerial overthrows, in 2010, when she had removed Kevin Rudd from his post in an uncompromising coup engineered within the ranks of the parliamentary Labor Party. Fantauzzo is a regular in the Art Gallery of New South Wales, which runs the Archibald Prize every autumn in Sydney. In 2008 he won the People’s Choice Award, which is run as part of the Archibald Prize, for his portrait of Heath Ledger, which was titled ‘Heath’. In 2009, he again won the same prize for his portrait, titled ‘Brandon’, of Brandon Walters, who played the young Aboriginal boy Nullah opposite Nicole Kidman and Hugh Jackman in Baz Luhrmann’s film ‘Australia’. In 2013 he again won the People’s Choice Award, for his portrait of actor Asher Keddie, which was titled ‘Love face’, and in 2014 he won the same prize for his portrait of his son, Luca. Winning this prize year after year means that Fantauzzo’s paintings were reliably hung among the finalists, but that he never won the ultimate prize itself. In his portrait of Gillard, Fantauzzo has chosen to position the subject’s head so that it is almost face-on to the viewer, but not quite. Gillard stares out of the canvas with her face held in a suggestive semi-profile, so that the outline of the left-hand side of her face is drawn in a gentle curve. Both of her earrings are visible. They are plain white drops. The slightly off-centre positioning of Gillard’s face lends variety to her features, which are consequently less severe than they would have been if she had been shown perfectly front-on to the viewer. Her eyes are focused on the viewer, however, so that the spaces between the pupils and the outer edges of her eyes are irregular, again adding variety to the picture. The white areas of her right eye and those of her left eye are not the same shapes. Her clothing, on the other hand, gives the picture a certain uniformity, as does her hair, which is cut mid-length so that it comes down to her shoulders, framing her face with its soft brown folds. The general impression of her physiognomy is thus framed by a controlled balance of symmetry and irregularity, neither of which characteristic is dominant. Both are strong and both lend variety to the painting. Likewise, the shadows that frame her face, that are buried in the sweeps of her coiffure, serve to highlight the features of her face. Cropping of Gillard’s head has been done so that the top of her head is cut off by the picture’s frame. Her left shoulder is visible but her right shoulder is not because it has also been cropped out of the picture. The way the cropping has been done makes Gillard’s face loom large in the frame, and it is not positioned exactly in the centre of the frame; with, as mentioned previously, her head turned slightly to the left, and with the area of canvas on the left-hand side of the picture predominating. But despite these compositional elements you still have a feeling of equipoise because the balance between things in the frame is seemly and appears to be just. Because the subject is facing slightly to the left, the painting has been given a slightly optimistic flavour, with the viewer’s gaze moving from left to right across the canvas. And the tight cropping makes the experience of looking at the subject’s face more intimate than it would have been if her bust (the head and shoulders of the physique of the subject of a portrait) had been portrayed in full: if both of her shoulders had been visible and if the top of her head had also been visible. Gillard’s sharp nose and smiling mouth combine with her heavily-lidded eyes to lend for the viewer an impression of both firmness and accessibility, as though she were listening to what you have to say but was reserving her judgement. The creases in her skin are realistic and tidily visible and the way they are drawn gives you the impression that the rest of the painting – the part that is not taken up by her face – is slightly out of focus. The highlights on her cheeks, forehead, the bridge of her nose, and on her chin and neck provide tonic points around which her features coalesce in a whole that is comprehended in an instant. There is a steely glint in the subject’s eyes. The strong curve of her lower lip reminds you of her characteristic broad Australian accent and of the way she used to command debate in Parliament when she was prime minister. The way the painting manages a thrusting subject with other qualities such as softness and balance goes some way toward giving the viewer a sense that while having a woman as prime minister might have been confronting for some people, experience proved that going down that path had in the end been a good idea. It also suggests that some things that happened during Gillard’s time in the top office were due to her gender (such as the institutional child abuse royal commission, which had just a day or so before the painting’s unveiling led, in Parliament, to an official apology to survivors and whistleblowers by the current prime minister). The background of the painting is where much of the drama is taking place. Fantauzzo has borrowed from both Howard Arkley (Australian, 1951 to 1999) and Edward Hopper (American, 1882 to 1967) and uses an air-brushed smoothness to depict an exterior that is both fantastic and real. The view from the windows behind Gillard’s head, which have insistent verticals that resemble the columns at the front of the House of Parliament in Canberra, show greensward, mountains, and areas of plain blue sky each of which lends depth and highlights the sense of serenity the organisation of elements in the picture create. Reactions to Fantauzzo’s rather conventional portrait were generally approving. Saturday Paper journalist Paul Bongiorno tweeted at 10.21am on 24 October, “Was at the unveiling of Julia Gillard PM portrait today. It is a knock out. I thought @TonyAbbottMHR was gracious in being there[, and] she acknowledged his presence. A class act on both their parts.” The reference was to the way that Tony Abbott had competed with Gillard when she was prime minister, including a notable speech in Parliament on 9 October 2012 in which she called the Opposition leader a misogynist. ABC presenter Virginia Trioli tweeted at 9.21am on 25 October, “I’m calling it: the 2019 @walkleys for cartooning: Mr Jon Kudelka. Bloody genius.” Her tweet contained the cartoon that Kudelka had produced and published the day before showing Gillard and Wayne Swan (who had been the Labor treasurer during the GFC) standing in front of the Fantauzzo portrait that is hanging on a gallery wall. Gillard is saying, “I wonder when Kevin’s going to –“ but before she can finish her question the portrait has scrolled through a shredder hidden in the lower part of its frame, destroying it. Behind the portrait of Gillard one of Kevin Rudd is revealed. The cartoon references a new book that Rudd had just launched which gives more information about his rolling in 2010 and the roles his colleagues played in the events of those days. It also references the gimmick that graffiti artist Banksy had used to destroy a drawing that had been sold on 16 October at an art auction in London for $1.4 million. At 4.18pm on 25 October @giddeygirl retweeted a tweet that had gone up a day earlier from @edgemonsta, that said, “Great portrait of an awesome woman. Umm, does anyone else think Julia’s nose has been slightly shortened?” Her tweet retweeted one from journalist Margo Kingston that had said, “Here’s to a great PM, a beacon of dignity and service since, and a fabulous human being, Ms @JuliaGillard.” Kingston’s tweet contained a photo of the Fantauzzo portrait. Fantauzzo’s name is pronounced to rhyme with “fanta bootso” if pronounced correctly. The vowels in Italian are pure, so all the sounds are pronounced individually, with no running together of the sounds (running sounds together is what normally occurs in English). So far, I have not heard anyone in the media pronounce his name correctly but that is not surprising as foreign names are often mangled by Australians in the public sphere.